The Ural is partially a Kazakhstan river that has a great significance to the country. Together with the Ural Mountains, the River is considered to be the traditional boundary between Europe and Asia. It means that the western part of Kazakhstan is legally in Europe. Did you know that this factor played an important role in acceptance of Kazakhstan in UEFA in 2002? Two provinces West Kazakhstan and Atyrau provinces are fully European, while Aktobe province is classed both European and Asian - Eurasian. The old name of the river Ural was Yaik. 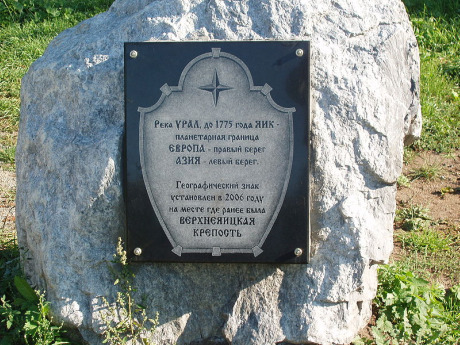 Catherin the Great had it renamed the Ural River in 1775, after the largest rebellion of the Yaik Cossacks. Zhaik (Kazakh version of Yaik) is the official name of the river Ural in Kazakhstan. The river was used for barge traffic up and down between the Caspian Sea and the Ural Mountains for centuries. Landmark "Europe-Asia", 2006 on the bank of the river Ural, where the former Upper Yaitsk Fort was situated. The Ural Mountains were also known as the Great Stone Belt in Russian history, the word Ural deriving from Turkic meaning a stone belt. 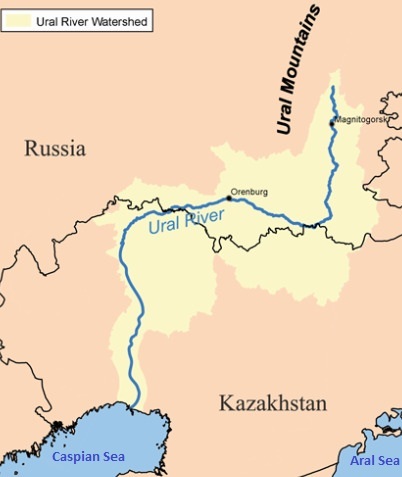 The river Ural starts in Southern Ural Mountains in Russia, runs all the way through Kazakhstan and ends feeding the Caspian Sea. It stretches to 2428 km (1511 mi) in length. Some major cities are situated alongside the river. Orenburg, which was the capital of Kyrgyz ASSR (present-day Kazakhstan) 1920 to 1925, now on the territory of the Russian Federation. The capital of the West Kazakhstan Province, the city of Oral is situated on the western side of the river Ural and is considered to be a European city. Atyrau, the main harbour city of Kazakhstan on the Caspian Sea at the delta of the river Ural. Partly European and partly Asian city, with a bridge connecting the two continents. 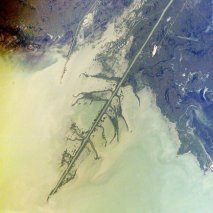 Just below Atyrau where the river reaches the Caspian Sea, it forms a digitate ("bird's foot") delta, as shown in this picture.